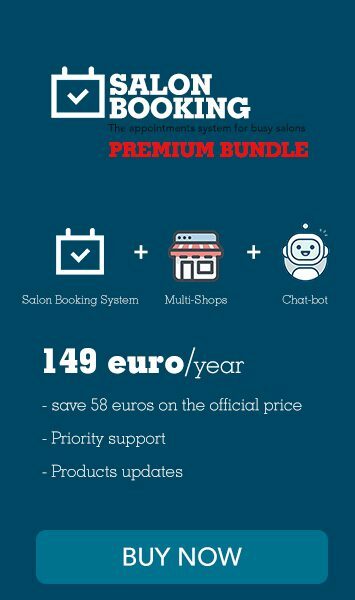 We’ve just released the a new version of Salon Booking system 3.21 and here you can find the list of the brand new features and improvements. Improved back-end calendar daily view UI to add reservations and block time slots. We slighlt changed the UI to add new reservations and block time slots from the daily view of the back-end calendar. We’ve added two new short-codes to display on your website pages the list of your assistants and the list of your services saving you a lot of content editing time. This short-code will display the services of the categories with ID 3 and 4, grouped into two columns using the default plugin style. We’ve added a new parameter to specify which assistants to display in the calendar. We’ve also fixed a bunch of bugs that you can see inside the last changelog. Our development team is working to make Salon Booking System plugin to complay the new european regulation for the personal data treatment called GDPR. As we are still ongoing on this matter we suggest you to take advantage of the latest version of WordPress 4.9.6 that provide a set of tool for users data management. At the same time you could consider to install and use a plugin like The GDPR Framework . In the next days we’ll give you some updates on our side ongoing work.